Throughout their decade of dominance, Pop’s Spurs have shown an ability to play many different styles and tempos on both the offensive and defensive side of the court. So what happened when they put it all together Tuesday night? Utter dominance. Behind a once waived and cut player (Danny Green) and an undrafted guard with no true position (Gary Neal), the San Antonio Spurs rolled over and over…and over the Miami Heat 113-77 as they now hold the 2-1 series lead. Green and Neal combined to shoot 13-for-19 from behind the arc and had 51 big points—more points than the entire Heat starting lineup. These two literally carried the team from 20+ feet from the basket. If you take away their dazzling shooting, the rest of the team shot 3-for-13 from 3-point range. Even though Manu Ginobili‘s line of seven points and six assists doesn’t seem like much to talk about, the Argentinian finally looked comfortable on the court. His game seemed more fluid, and he was making an impact on the game without scoring, something he has done extremely well during his time in San Antonio. Tony Parker (six points, eight assists) and Tim Duncan (12 points, 14 rebounds, two blocks) might have had their second straight quiet game, but it really didn’t matter. The Spurs were able to take command of this game with their role players leading the way, so these two simply were enjoying the game as much as the rocking AT&T Center. Don’t interpret their low numbers as low productivity. Even more than all these players, you have to give a large amount of the credit to Gregg Popovich and his coaching staff. He was not deterred with the 19-point loss in Game 2, stuck with his defensive gameplan against LeBron and the Heat that he has coached since the opening tipoff of Game 1 and continues to show why he will go down as one of the best NBA coaches in league history. He might be purposefully giving these one-to-two word interviews at the end of quarters after it was such a social-media hit the first time, but you have to respect the man’s work he’s put into the game. Oh and that guy that is the MVP? You mean the guy that has been MVP three of the past four seasons? Yeah, I didn’t see that guy out there Tuesday night. Jimmy Butler couldn’t stop him. Paul George couldn’t stop him. I’ll let you come to your own conclusion. Averaging 26.2 points, LeBron James scored at least 19 points in every single postseason game up to the NBA Finals. Through three games in this series, he has failed to reach 19 points once, and even though it has been a team effort to stifle The King and part of the blame can be directed at LeBron himself, Leonard has been the main man working to contain LeBron. To add on to all of this, Mr. James attempted zero free throws for the first time in his Miami postseason career, making the LeBron haters happier than Stephen Curry with an open 3-point shot. So with LeBron not playing like himself…or playing like himself…either way, he needed help. And the other two parts of the “Big 3” did not show up. Again. Dwyane Wade and Chris Bosh took 25 shots to get to 28 points—not very efficient. These two have now gone seven straight games without scoring more than 30 combined points, which is the longest streak since they became teammates. Even though these three have the most responsibility on their shoulders and are expected to perform at a very high level, I think the main “finger pointing” should be directed toward Mario Chalmers. This kid was praised in last year’s Finals for his 25-point performance in the Heat’s Game 4 victory. He apparently has the ability to really step it up on the big stage when it matters most…so we’re told. And were told countless times between Game 2 and 3. But here is my question: what about the little stage? What I am getting at is that Chalmers seems to disappear just as much as he breaks out for spectacular performances. That’s what makes these positive performances seem so much greater. The other performances are so terrible. Yes, Chalmers had 25 points in Game 4 last year. What about Games 1, 2, 3 and 5? Twenty-seven total points. This year, Chalmers broke out in their Game 2 win for 19 points to lead the team in scoring. Man did he look good. Last night? Zero points, one assist, four turnovers (mostly unforced) and an impact that literally hurt his team. That’s disgusting. Chalmers was helping the Spurs for most of his time on the court. In my eyes, he has to be competent one-hundred percent of the time for his “big stage” play to be praised. And more importantly, he has to be competent for his team to win basketball games. Just competent. In the end, this game is one win for the Spurs just like the Heat’s 103-84 win was just one win. Two years ago, Miami lost the NBA Finals after going up 2-1, so they know this isn’t over. Furthermore, these teams have a resiliency that has allowed both squads to bounce back like no other teams in the league. The Heat haven’t lost back-to-back games since January 8/10. When Duncan/Parker/Ginobili play, the Spurs haven’t lost back-to-back games since December 13/14. If these patterns continue back and forth, the Spurs will win the title in seven games. Yet, this series seems too complex to quickly analyze with some numbers like that. Each game in and of itself feels like its own series and momentum from game to game is nonexistent. Why else would a series with two blowouts feel like it could still go both ways? These two teams fight back hard. So what should we expect moving forward? Last year, LeBron took his game to another level when his team had their back against the wall. This year, the entire Heat team has taken their game to another level when their backs are against the wall. That’s why Miami’s average margin of victory after a loss in this year’s playoffs is 21.6 points. One simple statistic has to come true, though, for the Heat to win this series. They must win three of the final four games of this series. Consequently, that obviously means this Spurs team would have to lose three of the final four games. Do you see this team with this coach losing three of the next four games? Yes, the Heat have LeBron. I know, I know…I know. I’ve been reminded. But I have a gut feeling that San Antonio won’t play 48 minutes of basketball and lose three more times. 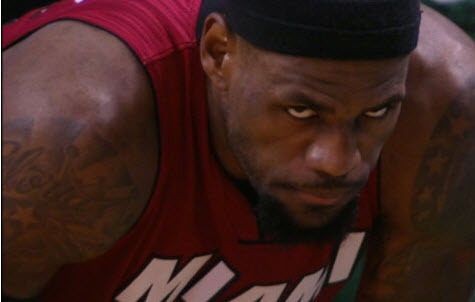 They have a defensive plan to contain LeBron that was only conquered in Game 2 due to Ray Allen, Mike Miller and Chalmers heating up from long range. Other than Mike Miller, who has been on an absolute tear in NBA Finals basketball, shooting 16-for-18 from 3-point range going back to Game 5 of last year’s Finals, can you consistently rely on this supporting trio to help out LeBron when he is forced to kick the ball out? Chalmers may show up for Game 4 but will he show up for Game 5? Game 6 if we have one? I just can’t say. And because Chalmers can’t seem to play consistently on any stage (I don’t see Norris Cole pulling a Danny Green or Gary Neal), LeBron is unable to get to the hole (whether caused by the Spurs’ defense or the King’s mental health), and the Spurs have a clear coaching advantage (this is the greatest difference in age in NBA history), the Heat might just have to wait for this “dynasty” to legitimately become a dynasty. In honor of the Spurs’ NBA Finals record 16 3-pointers they had Tuesday night and the fact that the Mavs won their championship exactly two years ago to this day, here’s a similar night the Dallas Mavericks had against the Los Angeles Lakers on their way to the title. Enjoy.